No treatment program for low back pain is complete without a great deal of attention to the prevention of further back problems. It is a common belief that most episodes of low back pain simply get better in 6 or 8 weeks no matter what type of treatment a patient receives. The problem with this thinking is that 90 percent of these patients will have recurring bouts of back pain. Without proper instruction on how to protect the spine, they will continue to do things that lead to further injury and deterioration of the spine. Without information about how to practice good spine health, patients are at risk for having increasing problems with low back pain and are more apt to eventually develop disabling back pain. The truth is that most people who’ve had back pain once don’t get completely better by themselves. They may begin to have less pain, but that isn’t always a sign that everything has returned to normal. Scientists have determined that having back pain, even once, can alter the way your back and abdominal muscles work, which can leave your spine unsupported and prone to another injury. That’s where Back Care Boot Camp comes in. It details these new facts. It also teaches you ways to energize your muscles again to protect your back and to reduce the chances of having a future problem. 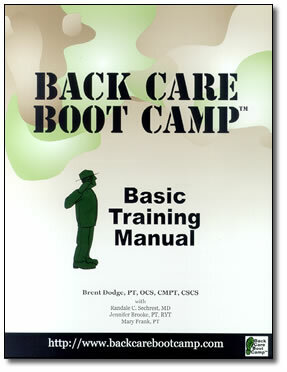 Back Care Boot Camp gives immediate guidance to help you head off potential long-term problems—before they occur. 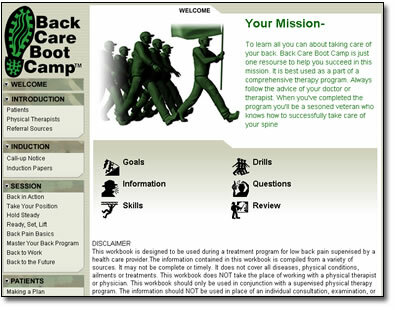 The Back Care Boot Camp program is designed to be used with a physical therapist as a guide. The program consists of 8 formal sessions of physical therapy and usually takes about four weeks to complete. The progam is designed to educate you about the importance of spine health and give you the proper tools to protect your spine into the future.